For Benjamin Kay, BS business administration ’12, basketball is much more than a game. It’s what keeps him focused and on the right path, both as a coach and as a good samaritan. As a business student at Drexel, Kay spent countless hours playing basketball at the DAC. Women’s head coach Denise Dillion took notice and asked Kay to be a practice player — scrimmaging and working drills with the team — which he did for four years. Kay applies that same philosophy to his role as the head men’s basketball coach for Penn State Brandywine. With just one season under his belt, he has helped the team win its conference championship for the first time in 50 years — while significantly raising its GPA. 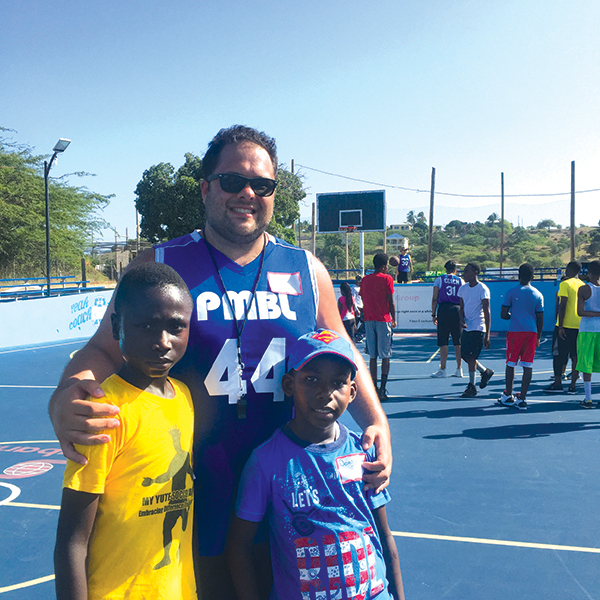 Each summer, Kay also travels more than 1,500 miles to Jamaica to teach those same principles at the PMBL Treasure Beach Jamaican Youth Basketball Camp, which he co-founded with some friends. The camp, which is free for underprivileged children, takes place every August at Jamaica’s popular Jake’s Hotel and Sports Park. It has grown in just five years from welcoming about 150 campers to more than 700. In addition to instruction from experienced players like college basketball coaches, an NBA referee and some Drexel women’s basketball players and alumni, the campers also receive three meals a day and free gear like sneakers, shorts and T-shirts. This is all made possible through fundraised dollars and donations of goods and services, which Kay and the other camp organizers work year-round to secure.